The birthrate in Oregon has fallen to its lowest point in 25 years. PORTLAND, Ore. — Women in Oregon are having fewer babies. Last year, the birth rate in Oregon fell to 42,067- the lowest number in 25 years. 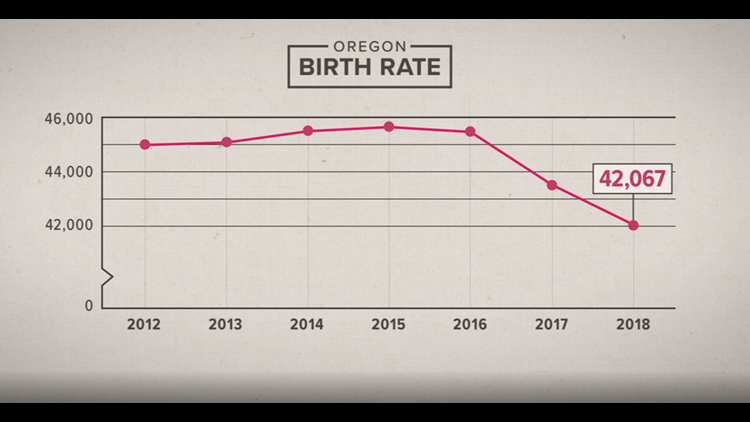 Newly released data from the Oregon Health Authority shows after years of relative stability- the birth rate has fallen for the second straight year. “We are surprised by how fast this has changed,” explained Jason Jurjevich of the Population Research Center at Portland State University. Researchers explain that one of the biggest factors for our declining birth rate is women are waiting longer to have babies. In 2000, most new mothers in Oregon were women ages 20-24, compared to 30-34 years old in 2017. The delay may not sound like much- but researchers explain, it’s less likely that a woman will have a second child. The research also shows Hispanic women are having fewer children. In 1990, Hispanic women in Oregon averaged 3.2 children, compared to just less than two children in 2017. Financial insecurity is one of the biggest reasons people aren’t having children or delaying it. Many of today’s young adults have student debt, housing isn’t cheap and they’re building a career. “They’re already crunched financially and stressed, so bringing a child into the world feels like it would be a lot,” explained Portland counselor Wendy Curtis, who created the Childfree by Choice support group. “Raising a child is a really important job and if they feel like they can’t do it really well- they don’t want to do it,” said Curtis. Birth rates in Multnomah, Washington and Clackamas counties have all declined over the past three years, which follow a national trend. Research shows Millennials, or those born between roughly 1980 and 1996, are having babies at the slowest rate of any generation in American history. Many women say expensive child-care costs, wanting more leisure time and not having a partner yet are factors for delaying or not having children. One of the biggest reasons is personal. Foster said childfree adults are becoming more accepted by society, but many people still face unfair pressure from friends and family. “There are people out there that think this is a societal obligation that you should have children,” explained Foster. The declining birth rate has implications for our state’s future, including education, housing and tax revenue projections. “Fertility tends to be one of these things that can take up to five years to potentially a decade or two before you see materially effects,” said Jurjevich. The population analyst notes that rural counties with slightly older median ages are already seeing declining school enrollment, greater pressures on healthcare systems, shortage of workers and stable or declining social safety net. For example, Coos County along the southern Oregon coast has seen the school-age population (children 5-17 years old) drop from 2,906 in 1990 to 2,332 in 2017, according to Jurjevich. “Having a sense of what these data mean for a local community is really important,” said Jurjevich. WATCH: Facebook Live discussion with Karen Foster, author of No Way Baby! : Exploring, Understanding, and Defending the Decision NOT to Have Children.